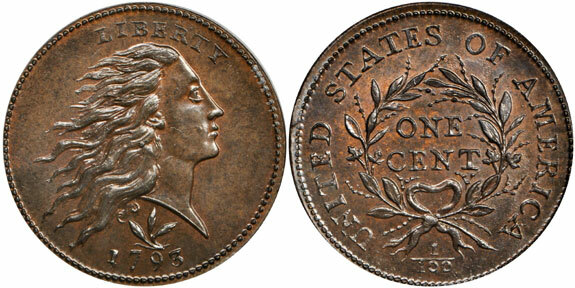 Stack’s Bowers Galleries is scheduled to auction a 1793 Wreath Large Cent, Sheldon-9, graded MS-69 BN by PCGS and NGC. Tracing its pedigree to the Virgil M. Brand, Dr. William H. Sheldon, and other famous collections, this coin represents the single-highest graded 18th century United States coin of any date, variety, or denomination. This extraordinary piece will be included in the New York Americana Sale held from January 22-25, 2013. Following the Mint Act of April 2, 1792, the Philadelphia Mint was put into operation that September. Patterns were coined, followed in March 1793 with the first copper cents, featuring the Liberty Cap obverse motif with first of the Chain Reverse type, then the Wreath Reverse style. The Wreath cents were struck from dies cut in high relief — not equaled earlier or later in the series. This is one of two landmark 1793 cents to be offered as part of The Cardinal Collection in the Americana Sale. The other is a Gem MS-65 1793 S-2 Chain AMERICA copper. The collection formed by Martin Logies is part of a cabinet containing many choice and gem large copper cents gathered over a period of years. and by phone at 800.458.4646. Great article! It would be very interesting to know the pedigree / ownership history of this remarkably well preserved specimen dating back to its minting. I’m always amazed that there are coins in such great condition in existence.